Daniel Luxury Apartments is a unique ApartHotel located at Lindos area in Kalathos Village. It is situated only 600 meters away from Kalathos Beach and a Five minute drive from Lindos Village. Our aim is to create your Home Away from Home. Public Services and entertainment are also available. The pool area offers sun lounges, BBQ area and 24 hour vending machines. An air-conditioned lounge bar is also available at the reception level of the Apart Hotel for your Breakfast or your Evening Drink while watching your favorite sporting event on our Satellite TVs. Daniel Luxury Apartments are located in Kalathos Village which is conveniently situated right in the center of the east part of the Island. Transportation from the hotel is available through Buses that run regularly all day and Taxi Service. In the surrounding areas you may find some of the most popular areas on the Island of Rhodes. Lindos Village is only 5km away, Pefkos Resort and Lardos Village only 6km away from the hotel or a 5 -10 minute ride by car or a Bus. Kalathos Beach is one of the longest and unspoiled beaches of the island. Vliha Bay is a very popular beach just 3 km. away from the hotel. A great selection of Beaches are also in Lindos Village including the magnificent St. Paul's Bay. Mini Golf and Go Karts are located in Lardos Village, just a small Drive away. Faliraki and Rhodes Town can be accessed easily by Bus in less than a 45 minute ride. Around the Hotel you may find Restaurants, Supermarkets, Bars, Bakery, Mini Markets and a Pharmacy. The new bedrooms are very large in size (aprox. 20sq. m.) with many standard amenities. In every bedroom there are 2 single or 1 double bed, satellite TV set, Internet service, large close-set, Telephone, Air-Condition, Balcony, Dressing Table with a chair and mirror and Safety Box. 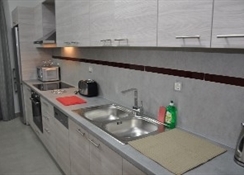 Full Kitchen with Stove, Electric Cooktop, Microwave Oven, Large Sink, Dishwasher, Full Size Fridge and Kitchen Table, Cooking Facilities and washing machine. All the living rooms have a Satellite TV, couch that turns in to a Double Orthopedic Bed (in most apartments), Phone, Fast Internet Service, Air-Condition, and 1-2 Balconies. The bathrooms are spacious and they have a shower cabin or a bathtub, depending on the size of the Apartment. In the 2-bedroom apartments there are 2 bathrooms (one with shower cabin and the other one with a bathtub). 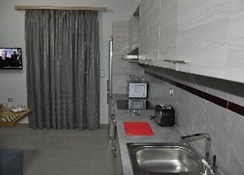 Also in the bathrooms there is a hair dryer, bathrobe, toiletries, slippers, large mirror, towels, ventilation, telephone, emergency buzzer, washing machine.Smoke Alarms in all areas of the apartments, Emergency Lights, Safety Box, Emergency Telephones, Bathroom Buzzer. 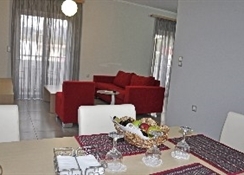 Daniel Luxury Apartments are conveniently located right on the main Rodou - Lindou main road at the Village of Kalathos. It is the Village right before Lindos coming from Rhodes Town or Diagoras Airport.